The system used for locating wells and springs in this report is based on the rectangular system for subdivision of public land. The States of Oregon and California are divided into 36 square-mile townships numbered according to their location relative to an east-west baseline and a north-south meridian. In Oregon, the Willamette base line and meridian are used, and in California, the Mount Diablo baseline and meridian are used. The position of a township is given by its north-south “Township” position relative to the baseline and its east-west “Range” position relative to the meridian. Each township is divided into 36 sections approximately 1 square mile (640-acre) in area and numbered from 1 to 36. For example, a well designated as 36S/11E-20DCA is located in Township 36 south, Range 11 east, section 20. The three letters following the section number (A,B,C, or D) correspond to the location within the section; the first letter identifies the quarter section (160 acres), the second letter identifies the quarter-quarter section (40 acres), and the third letter identifies the quarter-quarter-quarter section (10 acres). Thus, well 20DCA is located in the NE quarter of the SW quarter of the SE quarter of section 20. When more than one designated well occurs in the quarter-quarter-quarter section, a serial number is appended. For some wells that were field located during previous studies or by the California Department of Water Resources, a different system of letters following the section number was used for the location within the section. This system assigns a letter to one of 16 quarter-quarter sections (40 acres) that divide the section. 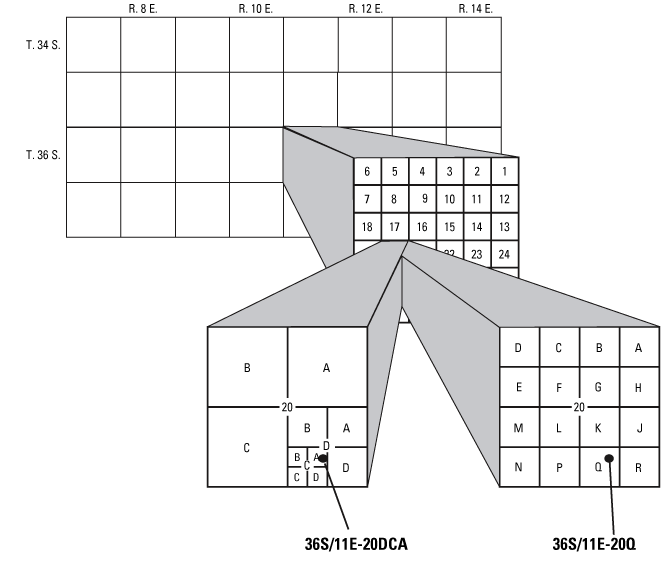 The location 20DCA corresponds to the location 20Q. When more than one designated well occurs in the quarter-quarter section, a serial number is appended.